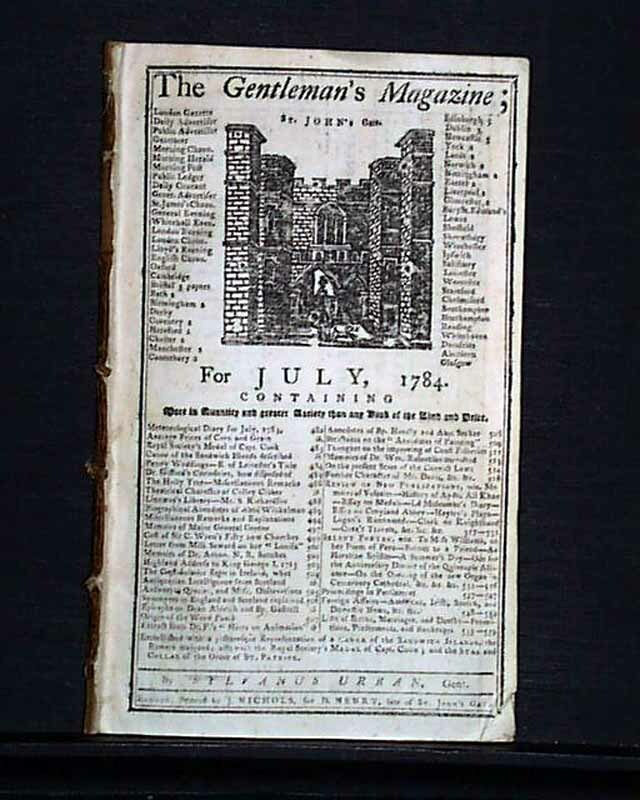 Item # 647204 THE GENTLEMAN'S MAGAZINE, London, July, 1784 The issue begins with a description of a medal created in honor of the late Capt. 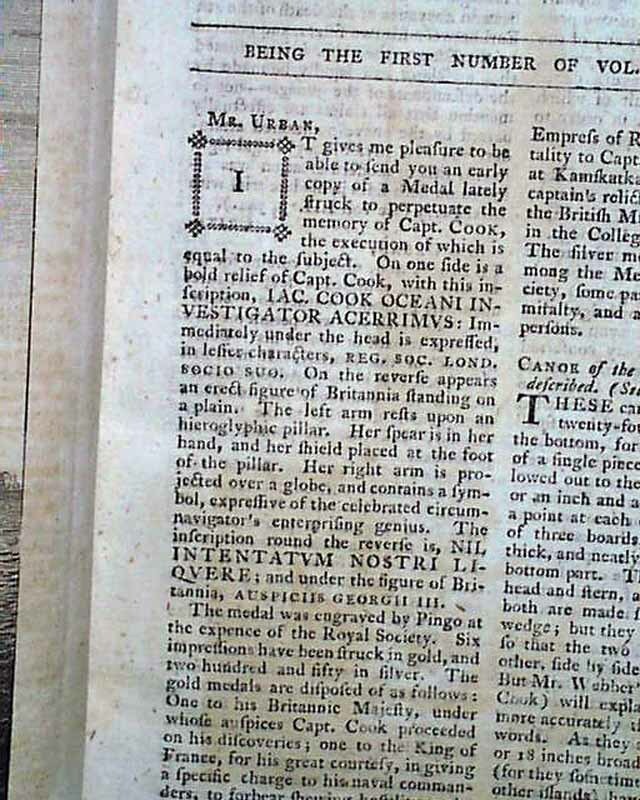 Cook and which is accompanied by a plate of it (see). 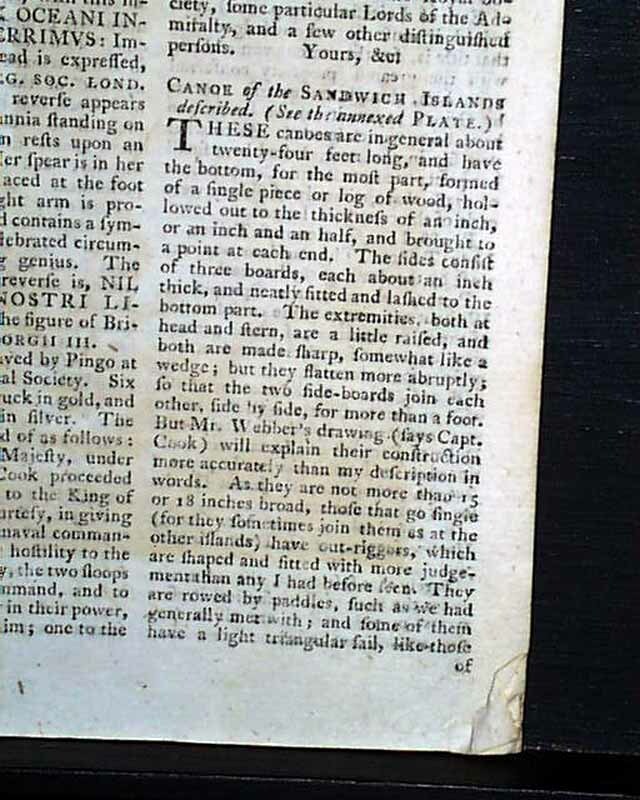 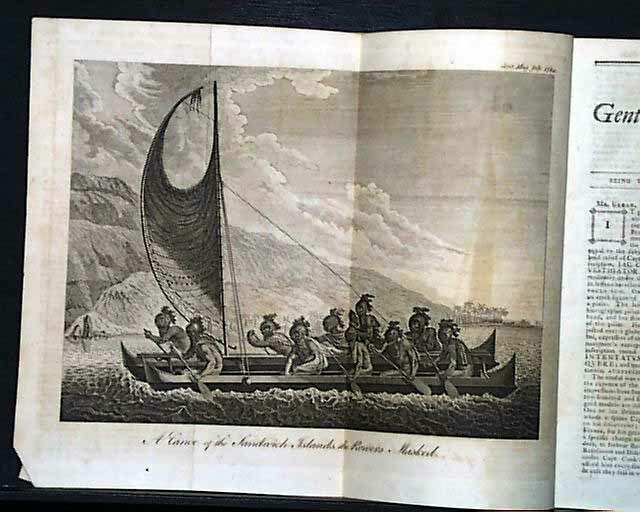 The front page also has an article: "Canoe of the Sandwich Islands Described (which is Hawaii), which is also accompanied by a geat foldout plate, more typically lacking. 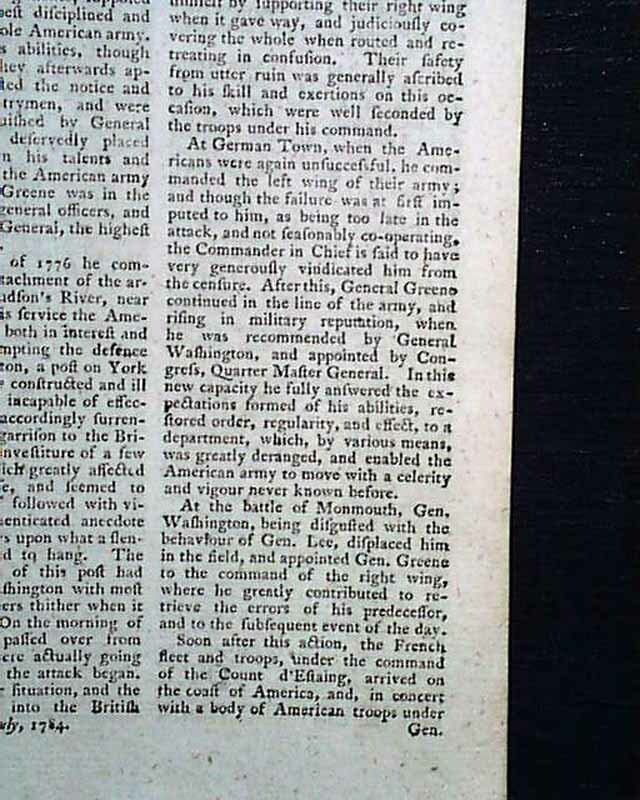 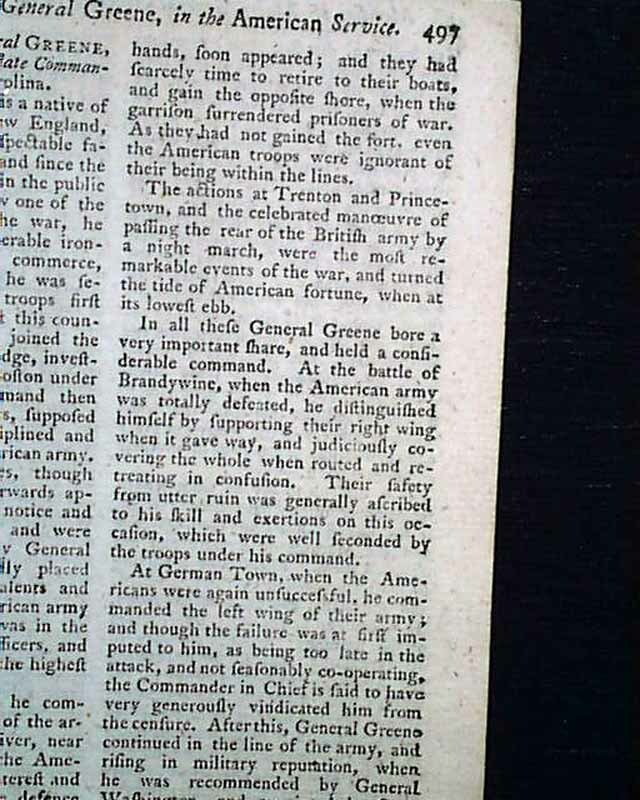 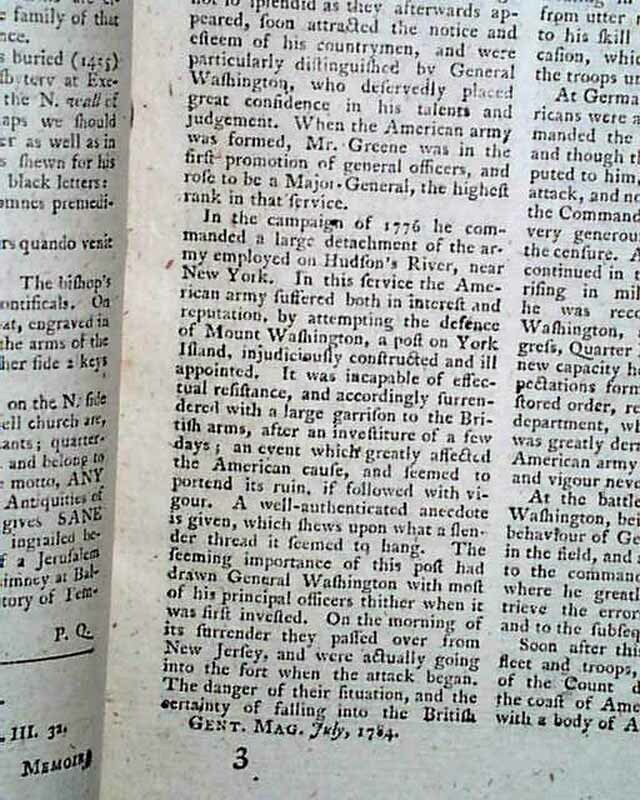 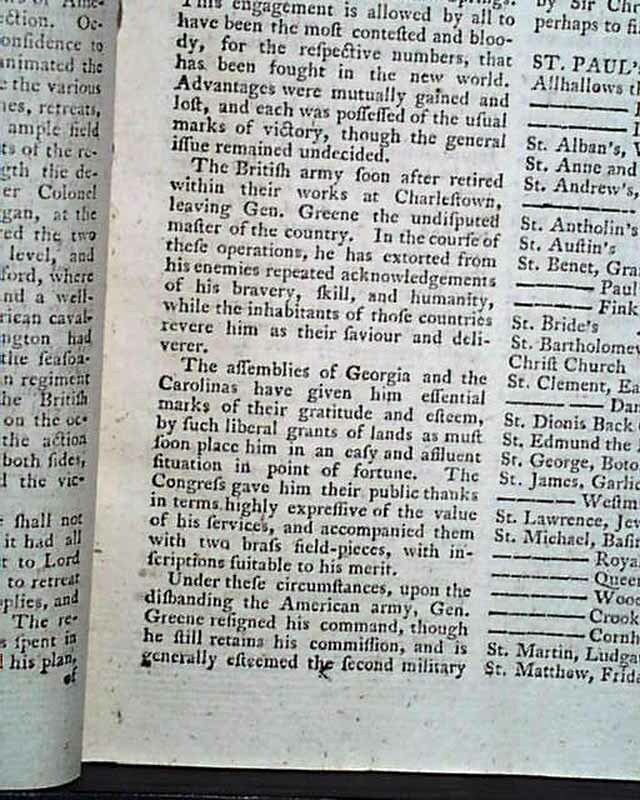 Another article of interest is: "Memoirs of Major-General Greene, in the American Service, late Commander in Chief in South Carolina" which takes over 2 1/2 pages and includes discussion of some of his major battles and a very nice review of his efforts in the Revolutionary War. 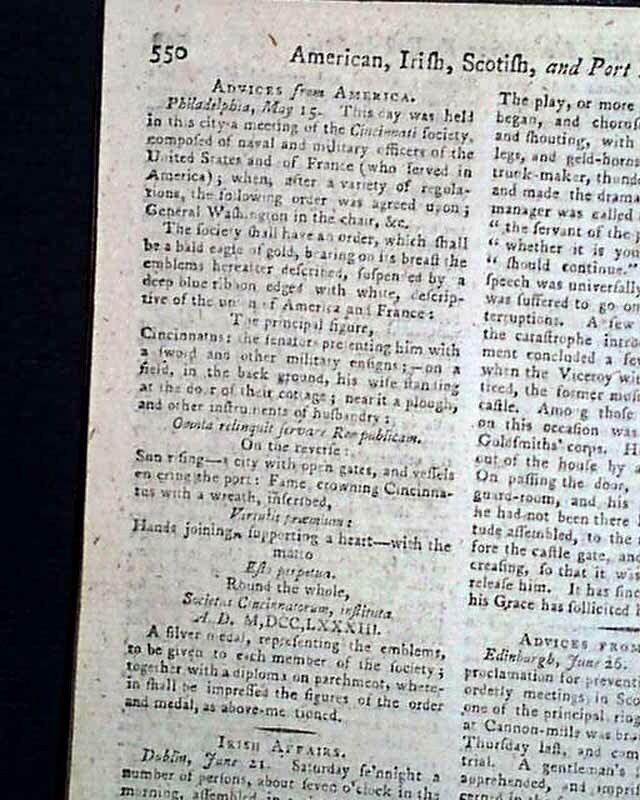 Near the back is: "Foreign Intelligence" which has half a column of: "Advices from America" concerning a meeting of the Cincinnati Society which elected George Washington as its chairman. 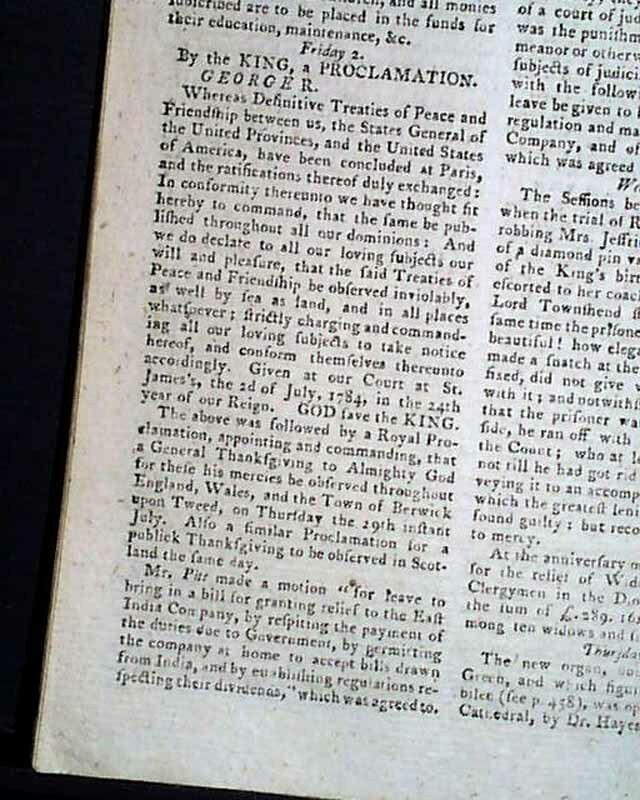 There is also "By the King, a Proclamation" which mentions the treaty of peace with America (see). 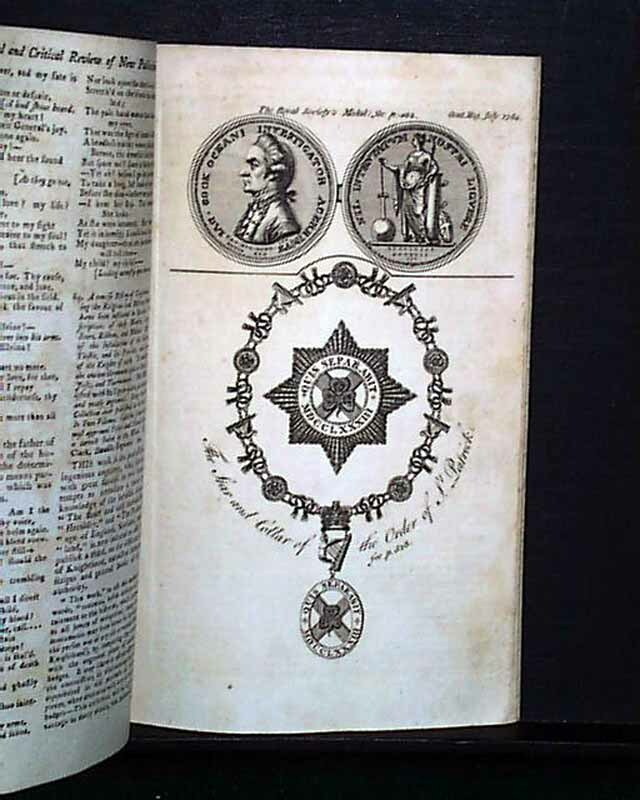 Both of the two plates called for are present and noted above. 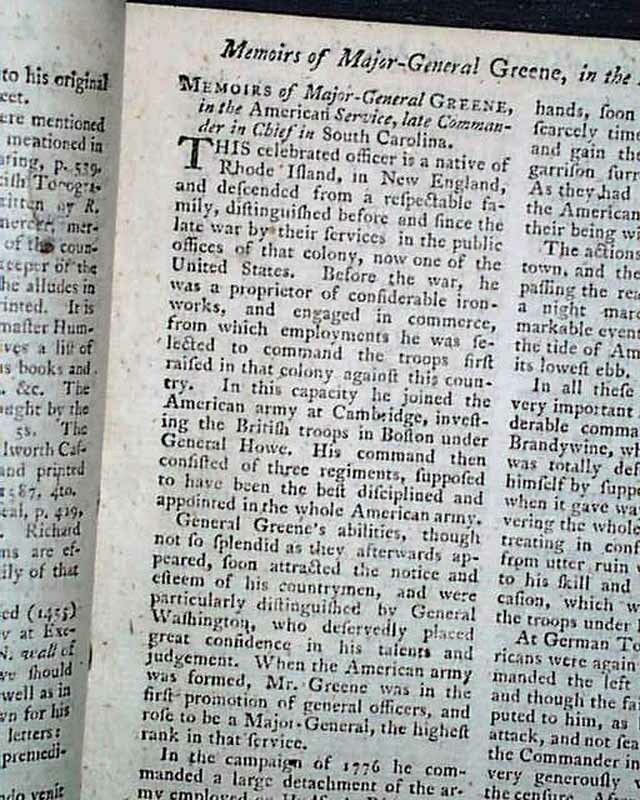 Complete in 80 pages, 5 1/4 by 8 1/4 inches, with a full title/contents page featuring an engraving of St. John's Gate.